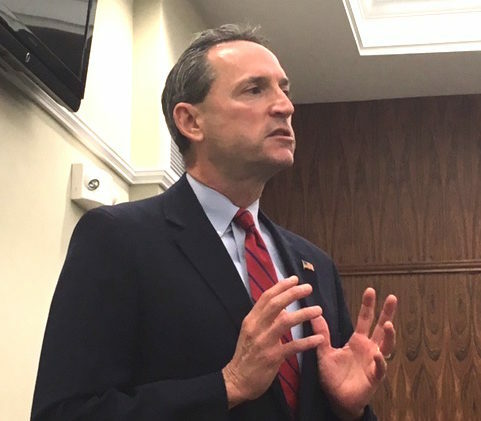 The Trump administration and its handling of immigrant children continued Wednesday to creep into Connecticut politics as Paul Doyle, a Democratic candidate for attorney general, urged the state’s three law schools to offer legal aid to immigrants facing deportation. Doyle, a state senator competing with Rep. William Tong and Chris Mattei for the Democratic nomination to succeed Attorney General George Jepsen, said he would coordinate “an anti-deportation effort” by legal clinics at Yale, the University of Connecticut and Quinnipiac University. Jepsen was one of 20 attorneys general signing a letter Tuesday urging the Trump administration to cease its policy of separating parents from their children at the border. Under increasing pressure, Trump signed an executive order Wednesday afternoon ending the practice. Susan Hatfield, a Republican candidate for attorney general, said Tuesday in an interview with New Haven Independent she supports Trump on immigration, including the separation policy.